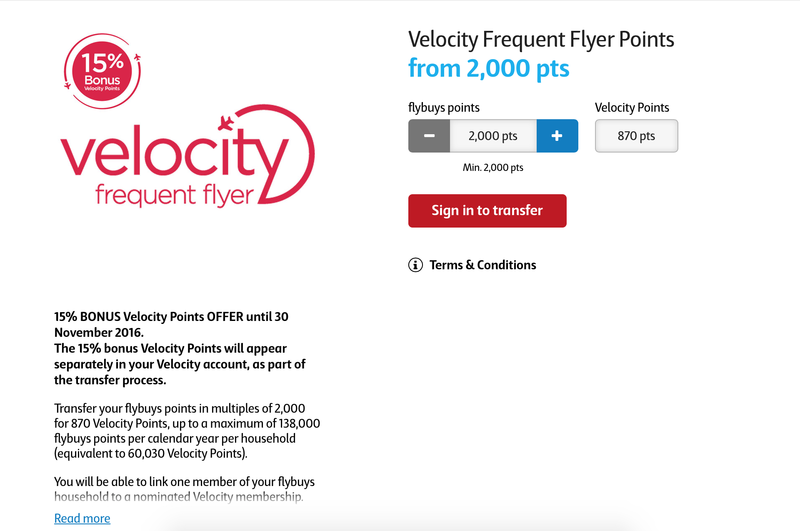 For a few weeks now Flybuys and Velocity have been running a promo for a 15% bonus on points when transferring. I decided I may as well transfer them over and get some value out of them rather than leave them with Flybuys. This post will explain how to transfer your Flybuys to Velocity points. First of all, you need to log into Flybuys and click ‘Rewards.’ You’ll see the Velocity points transfer now button; you press that. Next is the page where you select how many points you want to transfer. The terms and conditions are located on the side of the page. Now I have selected how many points I want to transfer; I’m ready to continue. And that’s the whole process, and it’s fast and very efficient. The thing I most like about the transfer is that the points post to you Velocity account instantly!